Maltipoos are small but highly energetic dogs and it is especially important that this breed gets all the essential nutrients it needs to maintain a happy and active lifestyle. Unhealthy dog food which is what the majority of supermarket dog food is loaded with is exactly what you want to avoid as these foods are packed with fillers and preservatives. Yes, they are cheaper than the more balanced, healthier premium dog foods, but it is well worth the extra money. It is also these same chemical fillers which causes allergies to flare up in your dog. Maltipoo puppies especially need attention given to the nutrients in their dog food. To help you get started on selecting the best dog foods for Maltipoos we recommend a high quality blend like the formulas mentioned below. These have been thoroughly researched using the ever scrutinous DogFoodAdvisor.com rating website, breeder guidelines and customer reviews. Let's get started! 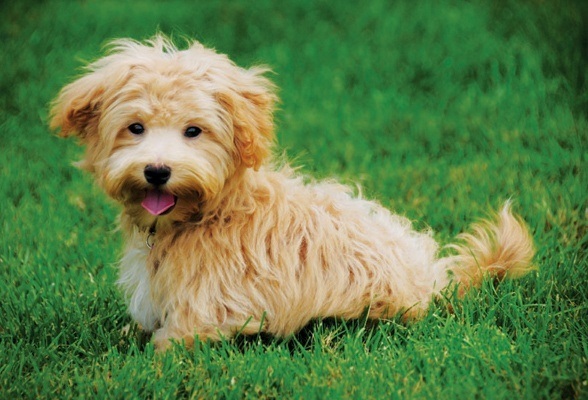 ​The Maltipoo breed is a mix of Poodle and Maltese, known for being undeniably cute, cuddly and a designer dog. This is an adaptable breed that does well in smaller spaces, with children, or with singles. Maltipoos are a great first dog to have because they love to please and are easily trained. Their temperament is friendly, calm, and easy going but are well known for their barking. Grooming is important for this breed, since they need regular brushing and monthly shampooing and deep conditioning to maintain their coats. How much food to feed a Maltipoo? Puppies at age 3 to 4 months that have just started feeding on solid food should have servings regularly of at least 3 times a day due to high calorie burning levels as it grows. A puppy needs at least 400 calories per day which should be reduced as it matures. Check out our in-depth guide to feeding puppies. An adult feeds approximately 14.1 grams of each pound it weighs while a puppy should eat 28.4 grams of each pound of its weight. Basically feeding calories should be proportional to weight. An adult Maltipoo should eat half of the calories of a puppy which is 200 calories per day and be fed once/twice per day depending on its activity levels. Allocate at least 15-20 minutes per serving for better feeding. Other factors to be considered include its activity levels, age and size. Per serving the food should contain all the nutrients in proper proportions such as lean meat-based proteins, carbohydrates, healthy fats and vitamins. Maltipoos share similar health problems to a Papillon like dental problems, eye condition (PRA) as they both belong to the small breed dog size. However, due to its cross breed nature, its health problems may be traced from both breeds of Poodle and Maltese resulting in shakers syndrome characterized by tremor for the white breeds. To avoid a high risk of this disorder whites should be mixed with a different color breed for better results. This mixed breed is prone to both external and internal allergies. If your dog is scratching and licking too much especially the paws and dry skin, it may be having different allergic reactions. These can be treated by changing things like the shampoo, laundry detergents and checking your pet for f﻿leas﻿. Powder and medicine should be administered. For food allergy, home-made food could be a remedy with a keen eye of ingredients used. This condition is common with toy dogs and is characterized by the collapsing of the neck rings inwards leading to breathing problems. It may be caused by excessive weight or strain on the neck when wearing a collar that is attached to leash leading to coughing and breathing noises. For the safety of the pet ensure little to no pressure on the dog's neck. Although they do well with less exercise, Maltipoos are still an energetic breed that require a high-quality meat protein dry kibble. This will also help them avoid oral health problems and skin problems that Maltipoos are sometimes known for. Great kibble for puppies, adults & senior Maltipoos. 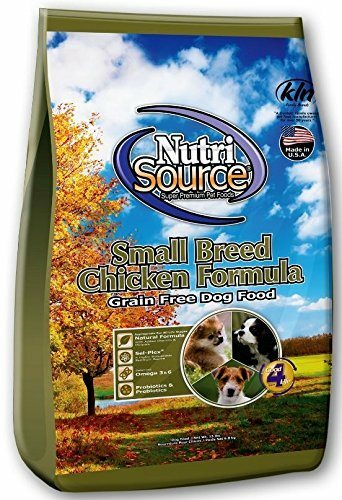 N﻿﻿utrisource Grain-Free﻿﻿ Chicken and Pea Formula Dry Dog Food is scientifically formulated to provide dogs with the highest quality nutrition out there and helps support a healthy digestive system. Real chicken is the number one ingredient in this USA made dry dog food that is great for all breeds and all life stages. This recipe includes Omega 3 and 6 fatty acids to provide dogs with healthy skin and coats, along with other vitamins and minerals for added health benefits. It's packed with proteins and nutrients and this blend can help Maltipoos with weight management issues. Some of Nutrisource’s responsibly sourced main ingredients include chicken, peas, and flaxseeds. We like that this formula has easy to chew kibble which is great for your dogs’ digestion. Dogs that have been switched to this food have seen improvement in common symptoms associated with cheaper quality dog food that has harmful ingredients and fillers, like bad skin and coat, low energy, vomiting, and other digestive issues including the elimination of dry skin and yeast problems. Since NutriSource® was created for all ages and breeds, this dog food is perfect for owners with multiple dogs who want to give their pets the best nutrition possible. A very popular option with Maltipoo owners, your dog will love this recipe as well as their other varieties. Low in carbs, great for sensitive Maltipoos prone to allergies. Nature’s Logic Canine Chicken Meal Feast is a highly palatable and nutrient-dense dry dog food proudly made with whole foods and no synthetic ingredients. The first ingredient in this recipe is high protein chicken meal, which is supported by vegetable and fruit concentrate for added nutrients. Nature’s Logic is 100% natural and grain-free and owners love how small and dense the kibble is, which is great Maltipoos. It's also lower in carbs than some others. My dogs love Nature's Logic and do wonderful on it! Nature’s Logic Canine Chicken Meal Feast contains probiotics and enzymes that support dogs’ digestion. This recipe doesn’t contain any corn, wheat, soy, or potato, so it won’t trigger allergic reactions in sensitive dogs. If your dog is allergic to peas and potatoes and prone to yeast infections or rashes, then this is a safe blend to try on your pal. Some of this dry dog food’s premium ingredients include chicken meal, pumpkin seed, apple, carrot, tomato, broccoli, and cranberry. This dry kibble is the next best thing to raw and home-cooked food for your Maltipoo. 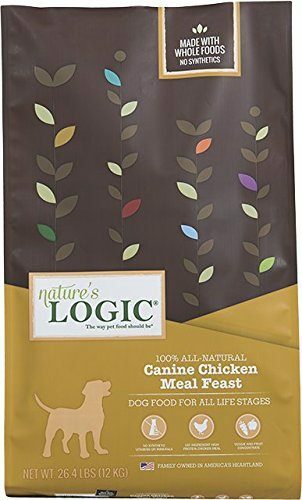 Nature’s Logic is a great dry dog food, there aren’t any synthetic ingredients in it and have some good proteins and are easy to rotate if you're interested in doing that. Pet owners love this natural dog food and see that it does wonders for their dogs’ digestion and gives them shiny, healthy coats and healthy stools. Even the pickiest dogs enjoy eating Nature’s Logic and don’t suffer from typical allergic reactions with this food. This is an all life stages product which means you can feed it confidently to your Maltipoo puppy or older dog. Great for weight management and palatable too. 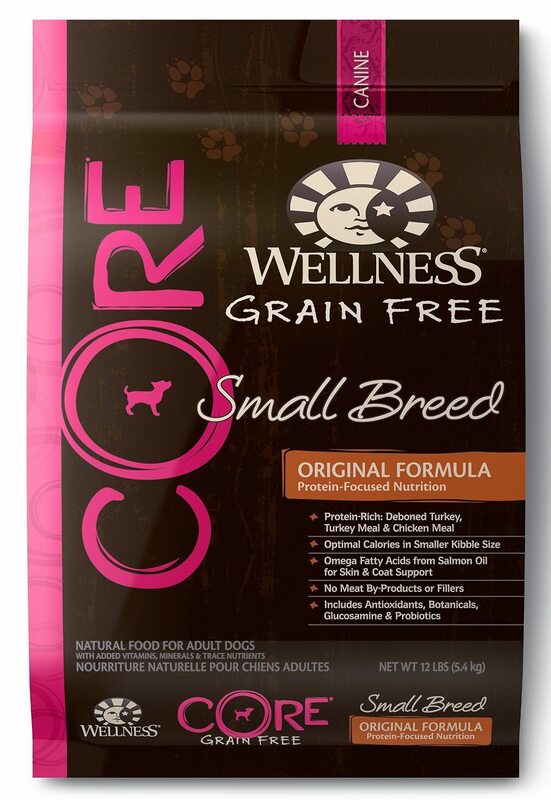 Wellness CORE Original Grain-Free Small Breed Formula is great for smaller breeds that require high quality kibble to meet their energy needs. Wellness CORE is protein rich, with deboned turkey, turkey meal, and chicken meal as some of its main ingredients. This is a calorie conscious choice with smaller kibble that is easy for dogs to eat and helps maintain healthy teeth. Best of all, Wellness contains no by-products or fillers that can be harmful to dogs. This dry food recipe contains salmon oil as its source of Omega fatty acids, which are great for keeping dogs’ coats and skin healthy. Glucosamine and Chondroitin are part of the formula in order to maintain joint and bone health, with added antioxidants for immune support. Some of the natural ingredients included in this recipe are apples, spinach, carrots, broccoli, and ground flax seed. This small breed formula was specially designed with the whole health of dogs in mind and is a great formula to feed your dogs on a daily basis. Wellness is a great dog food brand for owners that want to feed their dogs with whole, natural ingredients. Dog owners who switched their pets to Wellness CORE Grain-Free Small Breed Formula Dry Dog Foo﻿d found that their dog’s digestion improved and that it is easy for small dogs to eat. Picky dogs enjoy eating this food and their owners notice that they have more energy with this grain-free, small dog formula compared to others that they tried. This food is also great for overweight Maltipoos who need to lose a little bit of weight, due to its optimal calorie formula. So, What is the Best Dog Food For Your Maltipoo? When feeding a Maltipoo, owners should look for high quality kibble that supports the energy needs of small dogs. NutriSource, Nature’s Logic and Wellness CORE all offer grain-free dry dog food options for small dogs that use responsibly sourced ingredients, are nutrient dense and are palatable. Owners who are looking for high grade kibble that will provide their pups with more energy and support healthy digestion, should start by considering these highly recommended premium dog food brands. Want to buy Wellness Core for Maltipoo. The bag shown says ADULT. Ihave a puppy!! Do they make a puppy version? They do indeed Michele, the brand carries a puppy version – look for the Wellness CORE Grain-Free Puppy Chicken & Turkey Recipe Dry Dog Food recipe.